According to a recent report, there are now 66 million smart speaker devices, like Google Home and Amazon Echo, in the United States – representing more than a quarter of the U.S. adult population. Further, these devices scaled rapidly from 2016 to 2018, growing more than 800 percent by some accounts, and experts predict strong growth to continue in the years ahead. Yet, despite this astounding growth in recent years, only a fraction of smart speaker owners is currently using these devices for adjusting their home’s temperature, controlling smart appliances or managing other energy-related household tasks. While it may be another couple of years before these types of tasks become the norm for smart speakers, there are many other smart home devices that are quickly installed and can help you start saving on energy immediately. Even when you’re not using many of your household electronics, these devices can still draw quite a bit of electricity on standby mode or even when “turned off”. Some of the worst offenders are TVs, cable boxes and gaming consoles, but the many electronics in your home can all add up to quite a bit of wasted energy. Statistics vary, but the Lawrence Berkley National Laboratory states that standby power in an average home ranges from five to 10 percent of total household energy consumption. But, fortunately, smart technology offers a very simple, affordable way to curb this problem. Smart power strips and smart outlets both plug-in to your normal wall outlets and connect your home’s WiFi network. Once you plug your devices into your smart power strip/smart outlet, you can control them remotely via smartphone, view current and past energy usage, set timers and much more. By using these simple smart devices, you can considerably cut down on your home’s wasted energy, and for just a small financial investment. Many popular smart outlets can be found on Amazon for under $20, and best-selling smart power strips for not much more than that. One of the best energy-related investments you can make for your home is installing LED light bulbs. According to the U.S. Department of Energy, LEDs use 75 percent less energy and last 25 times longer than their incandescent counterparts, meaning they will very quickly pay for themselves with your energy savings. If you haven’t made the upgrade to LEDs yet, you may want to look at smart lighting, which provide the same benefits of normal LED light bulbs – plus a few more. Smart light bulbs can be dimmed to use less electricity or controlled remotely in case you forget to turn them off – plus they can often change colors and offer other aesthetic benefits over normal lightbulbs. The first time you purchase smart lightbulbs you will need purchase a hub that connects each bulb to your wireless network, but after that, the individual bulbs aren’t much more expensive than normal LED bulbs. With guaranteed energy savings, extremely easy installation and a high level of convenience, smart lighting is probably the best first foray into smart home tech. In fact, a recent New York Times article called smart lighting the “one smart home gadget for everyone”. Okay, you may be thinking, “A smart thermostat isn’t affordable,” but you’d be surprised at how economical these powerful devices have become in recent years. Smart thermostats learn your behaviors and preferences and more efficiently heat and cool your home, leading to considerable savings on your monthly power bill (about 10-15 percent based on third-party studies). Over just a year or two, this can directly lead to hundreds of dollars in savings, depending on this size of your home, your preferred temperatures and other factors. However, while some of the top-end models cost over $200, there are much more affordable options out there. For example, the popular ecobee3 lite retails at $169, and both Honeywell and Nest offer similarly priced options. But the best and most affordable way to purchase a new smart thermostat might be through your current electricity provider. Electricity providers want to incentivize their customers to be more energy efficient and often offer instant rebates of $50-100 for smart thermostats online. 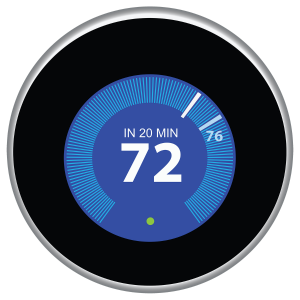 For example, currently through ComEd Marketplace, a ComEd customer can purchase an Emerson smart thermostat for only $49 and a Nest Thermostat E for only $69, making these devices a very practical investment for your home that will quickly deliver a return. While smart home products can certainly be quite expensive, they don’t have to be. And, in fact, there are many that are not only affordable, but will also save you money over time. If you’re interested in learning more about smart home technology, checking with your current electricity provider may be a good place to start. In addition to the rebates and offers mentioned above, many utilities provide buyer’s guides or other resources to help you understand the pros and cons of each product. To learn more about the many changes coming to the world of energy, check out our Evolving World of Energy series on how we get, how we use and how we pay for energy.